The story of how south Wales produced its own wine at the end of the 19th century has been told in a new book. 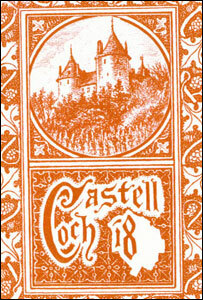 Castell Coch wine was produced as part of what were claimed to be the first commercial vineyards since the middle ages, set up by the Marquess of Bute. The first harvest of 1877 yielded about 40 gallons of a sweet white wine. David McLees, Cadw's Inspector of Historic Building, said, "It's amazing to think Cardiff could once boast its own wine." 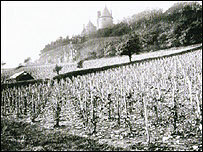 The Marquess of Bute, who owned Cardiff Castle and built Castlell Coch on the outskirts of the city, planted three acres of vines in 1875 on the slopes. His head gardener Andrew Pettigrew - despite no knowledge of French - was sent to France to learn techniques from wine-makers of Champagne and Medoc. Protected by trees and aided by good weather, the Le Miel Blanc grape at the Castell Coch vineyard produced a small harvest. Lord Bute, whose fortune was built on coal, also had vineyards at Cowbridge and Swanbridge in the Vale of Glamorgan. Mr McLees said: "Despite Punch's prediction that if ever a bottle of wine were produced it would take four men to drink it - two to hold the victim, and one to pour it down his throat - it was generally well received and even likened to a first-class still champagne." The vineyard went on to produce red wine, but with the onset of World War I, sugar - a vital ingredient in fermentation - became impossible to obtain. Production stopped in 1914 and, by the 1920s, the vineyard was finally dug up. The story, along with archive photographs, is told in a new guidebook to Castell Coch, written by Mr McLees.